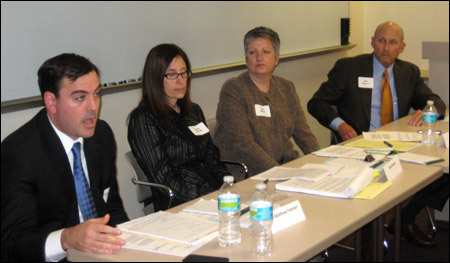 Paul E. Rice, Jr., Esquire of the Rice & Rose Law Firm, seated far right, was chosen to serve on the Family Law Panel for the 2012 Professionalism Symposium for the Seventh Judicial Circuit. The event was held at Embry-Riddle Aeronautical University in Daytona Beach, Florida on May 10, 2102. The keynote speaker for the event was the Honorable John Antoon, II, United States District Judge for the Middle District of Florida. After the keynote address, participants attended break out sessions in Appellate Law, Criminal Law, Civil Law and Family Law. The other Family Law panelists, pictured from left to right, were Circuit Judge Matthew Foxman, Dawn Nichols, Esquire, Lisa Starks, Esquire and Mr. Rice. The event was attended by 107 lawyers and judges. The Seventh Judicial Circuit consists of Volusia, Flagler, St. Johns and Putnam Counties. The purpose of the event was to promote professionalism within the legal community, which means conducting oneself not merely in an ethical manner but in a higher way that brings honor and respect to the legal profession.